What is 'autistic culture' and where did the concept of autistic culture, autistic communities begin? What would happen if, for a change, autistic people began showing the way for their own communities? This book takes you on that journey. Published in 1995, Somebody Somewhere is Donna's Williams' second number one international bestseller in the mainstream publishing world. It is the second book in the autobiographical series and like each book can be read as a stand alone book. Diagnosed in the 1960s as psychotic at the age of two when autism was known as Childhood Psychosis, Donna has lived 26 years believing she was born mad. Now, Donna meets psychologist and autism expert Dr Marek who reconfirms her diagnosis with the more modern day term of autism and offers to work with her. But when he suggests he can give her training in social skills and handshakes, she is not interested in learning to further bury herself in 'acting normal'. Instead she determines to get from him the non-autistic translations for the array of experiences and concepts she has only ever made sense of in her own special language, kept secret within her own world. Dr Marek is soon not the only teacher. Navigating the combinations of xenophobia, charity, curiosity and kindness, Donna graduates as a teacher and travels overseas to work with autistic children and other adults like herself. 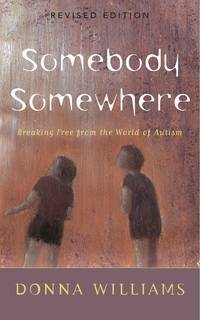 In the process, she finds a way of belonging and 'simply being' among others without selling out who she really is and lays foundations for changing forever the way autism is understood by the wider world. I wrote my second autobiography, Somebody Somewhere because I was changing so fast I feared I'd move on from this important new phase without ever documenting my perception, thinking, values and communication style at that time. Somebody Somewhere was so completely different to Nobody Nowhere and exposed a world of such different, forgotten citizens of the world, that the story had to be told, to give a voice to the voiceless, to be a starting point for solidarity and building bridges. It too became a number one international bestseller. Together inside of a Hula Hoop, Michael and I went for "a walk“ with Michael leading. We stopped at the playground, climbed out, and played follow-the-leader until neither of us could tell who was the follower and who was the leader. We made musical patterns out of the sounds made by tapping various wooden beams and metal pipes, and filled in each other's tunes, composing. One cannot fly with a physical body they say. Nor can one walk into a mirror. Olivier was sane. They were illusions, not delusions. If you had asked him if people can fly, he would have told you straight, no.